Everything that you need is in the compression hammock bag to hang your Hang Easy Portable Hammock. Included in your purchase is the hammock, hang tight hammock straps and 2 aluminum carabiners. If you are reading reviews of this hammock from a year or so ago, just keep in mind that the Hang Easy Portable Double Camping Hammock by Nature's Hangout didn't provide straps at that time with your hammock purchase. Now they do provide straps. They listened to the reviews that people wanted everything included and made that change. You get a full money back guarantee if you are not completely satisfied with the The Hang Easy Portable Camping Hammock. No questions will be asked. The full money back guarantee is for the lifetime of your hammock. People who purchased this hammock and then reviewed it seem to have very good things to say about customer service with Nature's Hangout. This hammock is designed to hold no more than 500 pounds. There is plenty of room for two people to hang in this hammock, just so long as you don't go over the weight limit. With that being said, this hammock is great for one extra large person or large sized adults. If you a an average adult sized persona or even extra small in stature but like more room in you hammock, then the Hang Easy Portable Double Camping Hammock by Nature's Hangout will not disappoint you. If you would like to hang more weight, then there are competitor hammocks that hold much more weight than this one. It all depends upon what your needs are. The material is extra soft and comfortable next to the skin. Keep in mind though, that this hammock material is not thermal so if you will be using it in cold temperatures, make sure to bring along a camping pad and/or thermal sleeping bag. The nice thing about this material is that it will not retain heat in hot conditions either. So no need to worry about extra sweating. Even the smallest gentle breeze can be felt through the Hang Easy Portable Double Camping Hammock by Nature's Hangout. The stitching is all triple stitched at the seams. This will provide you extra protection against tears. Be careful to not let this hammock brush against sharp rocks. One camper set their hammock a little too low and it brushed against a sharp rock just once before they were able to raise the hammock. The rock ripped the hammock and made a hole. Though the customer realized it was his mistake, he warned to not let this material touch sharp objects. The Hang Easy Portable Double Camping Hammock by Nature's Hangout is a comfortable hammock. Customers who slept in it overnight and also in the more expensive brands said they could tell no difference. Many suggested to save money and by this hammock if the extra money is a concern. Also, many said that after sleeping in the Hang Easy Portable Double Camping Hammock by Nature's Hangout, they would not go back to tent camping. This hammock will cocoon around you. It's a bit different than the hammocks that hang out flat with a bar on each end. This type of hammock is especially made for sleeping and packing up small in a bag for camping. If you'd like to use it during the daytime and get some sun on your body, then I'd recommend laying down with your feet out using the width as a laying bed instead of the length. That way it won't cocoon around you. The competitor hammocks like this do the same thing, so know what you are wanting in a hammock before purchasing. If your time is important to you like it is to me, you'll be happy to know that this hammock doesn't use up a lot of time to set up. You can use your time for what matters more, like relaxing in your hammock. The Hang Easy Portable Double Camping Hammock by Nature's Hangout sets up in a matter of minutes. The straps make it very easy. Reviewers who used this said that even older children could set up this hammock without issues. The price for the Hang Easy Portable Double Camping Hammock by Nature's Hangout is about middle of the line. It's not one of the least expensive and it's no where near the most expensive hammocks on the market. With this hammock you don't get color choices. If you don't the orange and black, then you are out of luck. People who bought this hammock said the colors looked sharp and attractive in person. The carabiners are made from aluminum. They have no sharp edges that may rip the hammock when it's in the compression sack. The hammock and all of it's parts fit into the hammock sack. The sack has now been upgraded to waterproof compared to what this company used to make. The compression sack is sewn right to the hammock. This is nice so that you don't loose the bag while you are hanging. The sack can also serve as a place to put your drink, cell phone, or snacks while relaxing in the hammock. The suspension ends are now made from 100% polyester. They have zero stretch and are stronger than the nautical ropes that some camping hammocks use. This company has made a lot of upgrades in their hammock products and this is one of them. When the Hang Easy Portable Double Camping Hammock by Nature's Hangout is unfolded it measures 9 ½ feet long by 6 feet, 2 inches. While this is plenty big for a single person it will also fit two people. Although customers did comment that quarters were pretty tight on this hammock with two on board. However if you are sitting up with your feet out, this hammock easily accommodates two adults. This hammock compares right up there with ENO which is considered top of the line. However, the price of the Hang Easy Portable Double Camping Hammock by Nature's Hangout is much less. This hammock does weigh slightly more and the pouch is just a little bigger. But if you aren't an ultralight backpacker don't mind the slight difference, then you will save some money by buying this hammock as opposed to the comparable higher priced hammocks. After careful review of the Hang Easy Portable Double Camping Hammock by Nature's Hangout, I recommend this product. It compares right up there with ENO but at a fraction of the cost. Here are some top questions that I found for people seriously considering buying a Hang Easy Portable Double Camping Hammock by Nature's Hangout Hammock. What it is the comfort as compared to brands like Eno? People who slept in both brands said they could not tell the difference. 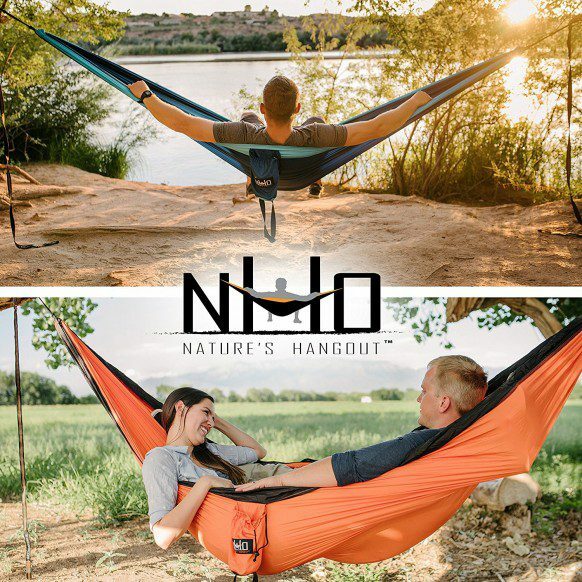 The Hang Easy Portable Double Camping Hammock by Nature's Hangout is a comfortable hammock for sleeping or just hanging out in. I'm confused. I thought this hammock didn't come with straps. Does it come with straps or not? Yes, the Hang Easy Portable Double Camping Hammock by Nature's Hangout comes with straps. It used to not come with straps but now it does. Everything that you need to hang your hammock is included. Is this hammock good for backpacking? Yes. Many people love this hammock for backpacking. However if you are an ultralight packer and want the lightest and most compact hammock out there, you can actually find lighter and more compact hammocks. But this really is very close to the lighter models.